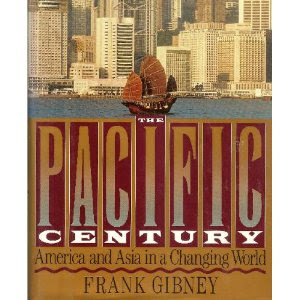 The Pacific Century was a 1992 PBS Emmy Award winning ten part documentary series narrated by Peter Coyote about the rise of the Pacific Rim economies. Alex Gibney was the writer for the series, and Frank Gibney, his father, wrote the companion volume, The Pacific Century: America and Asia in a Changing World. The series was a co-production of the Pacific Basin Institute and KCTS-TV in Seattle. I looked all through the net, and wasn't able to find the complete 10 hour version. It appears this documentary was shot with early analog video technology & it certainly is evident with the digitized copy. I couldn't find the other episodes on youtube either. I taped it from PBS years ago but either unknowingly lost or disposed of it. I wrote Alex Gibney personally last October about how to get a copy. He replied that he lost the rights for the series archive expired and it's no longer available. Since watching this, years later I've ended up living in Tokyo, and have been here for the past decade working across the Asia Pacific region. The knowledge in this series was enough to lead my skills confidently in this direction, and the way the region is playing out is like a continuation of the documentary, so I think it is still extremely timely. I grew up watching re-runs of this on the local city channel in the nyc area. Naturally enough, part of the reason i love this show so damn much is because of nostalgia, but the series itself has aged well. China and India may no longer be beneath Japan, but the underlying sentiments and forces at play are the same as ever. PS: The pacific century's pomona website was recently shutdown and in its place is a website/study companion for the book series. It contains the vast majority of the episodes, including the episodes missing from you tube. I myself downloaded the fight for democracy from a torrent two years ago. Just respond and I'll gladly send it over to you. Great! I'll search for the fight for democracy on bittorrent. And yes the full set of videos are available at PacificCentury.org. Some are password protected, but still kind of public and unprotected pages. Thanks! I'll see if I can incorporate a reference to the site into the blog page.